Today is day after the 100th day of the new PLP government. My commentary shouldn’t be on the front page of the newspaper. Instead the government should have made it clear what they accomplished in time for the 100th day rather than waiting until next week to table a report. The sheer lack of communications on the part of the government meant the paper looked for pretty much anyone who had actually been tracking the first 100 days to quote. It is certainly not a good sign when the editor would rather publish the commentary of an unaccomplished nobody over the government. 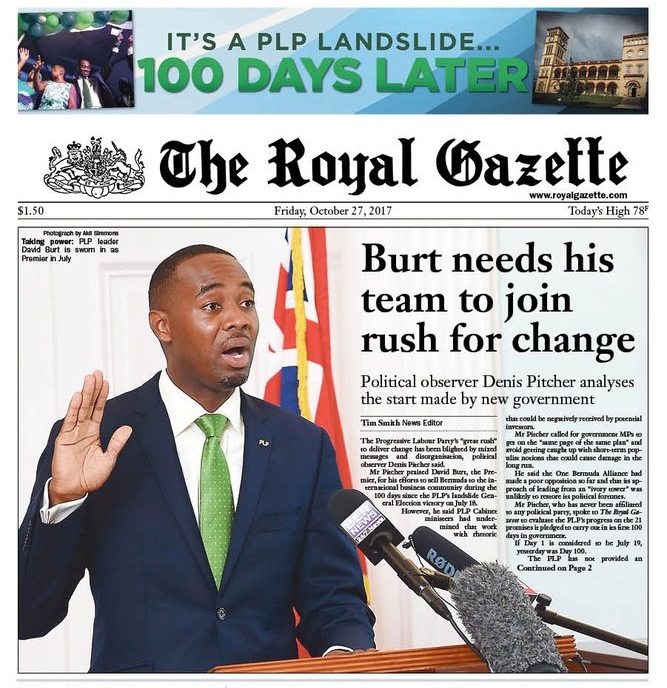 The last time my commentary was on the front page it overshadowed the last government’s announcement of their election platform. That proved to be a bad omen. One could only wonder why the editor would choose to highlight my commentary over the platform. What did that say about the platform? What did that say about the level of excitement about the prospects of the next government? I tend to think it didn’t say good things. It is sad that my commentary is news. I don’t relish the idea of being on the front page and suspect it is largely because I’m one of the only regular commentators out there vs. having many great insights. The first time it happened was shocking as I had expected my commentary to be filler content. This time is not as surprising but saddening for what it implies. Personally I would rather make the front page because I had accomplished something more than being an armchair critic. Critiquing is easy, being on the front lines driving change and facing criticism is incredibly difficult. A large reason why I take the time to write my thoughts is not to pretend I know better. I’m a novice at most things and an expert at very few. Instead, I write mostly to provide some feedback and practice some of the things I’m poor at, like writing and communications. In the case of these 100 days, my goal has been to demonstrate how I would like to see our government and opposition communicate progress. So, what does my commentary being on the front page on the 100th day imply? What does it say about what the PLP have accomplished in their first 100 days and how they’ve communicated it? What does it say about the opposition OBA and how well they’ve ensured the PLP is delivering on what they promised? What does it say about my own thoughts and commentary? Does it say a lot without actually saying it? Should my commentary really have been front page news? Why am I tracking The First 100 Days pledges? 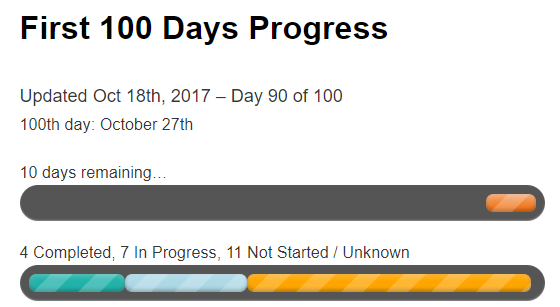 The purpose of tracking the First 100 Days progress is to highlight how I believe the government and the opposition should be communicating and tracking progress. Neither the OBA or the PLP have managed to strongly communicate their efforts in the modern age of the internet. Each has room to improve how they get their message out to the people. It is not the aim of the page or this site to ambush or sabotage the government, nor is it the aim to do the job of the communications department. The First 100 Days Scorecard is a reflection of how clearly progress is communicated to the people and an example of how I would like to see it done, not a go to source for updates. A reader wrote in to say that the PLP gave a variety of status updates for the First 100 Days at their delegates conference. They recommended I watch the live recording and put up updates. As a struggling entrepreneur I do not have the time to watch and parse a video to distill the government’s updates for them. Even if I did that isn’t the aim of my page. It is the job of the government and the opposition to clearly communicate through as many means as possible what their messages are to ensure their message gets to the people. That is not the job of this site and frankly it isn’t the job of the media either. I was very critical of the OBA for their constant use of press conferences and verbose statements to make announcements (see twitter). I regularly commented with regards to their communications efforts and the lack of explanations and clarity that led to problems with initiatives like immigration reform and the airport project. The government needs to take responsibility for managing its own message. Any failure to do so is an excuse. The PLP were relentless in attacking the OBA for their poor communications. I wasn’t terribly kind either (as a lowly armchair critic). As such, the PLP cannot expect to get a waiver from being expected to improve communications. The government needs to make information as readily accessible through every medium possible as they can. This is 2017 not 1917. There are a wide variety of easily accessible and low effort mediums that can be used to communicate the government’s and the opposition’s message. There is a whole communications department in government with paid staff whose job it is to communicate progress. There are government websites. Social media like facebook and twitter. A government TV channel. Youtube. Instagram. You name it. A wealth of accessible mediums available each speaking to different audiences. In order to get your message out you need to utilize as many as you can. This site is just a sample of what I’d like to see in terms of a regularly updated page that provided bullet point updates on pledges. It doesn’t take a whole lot to put up a wordpress website and make regular updates. If a struggling entrepreneur can make time a few minutes each day then certainly it should be possible for a government with a near billion dollar budget to do it. Calling people in IB whiners is not likely to be a great source of growth. Sadly things are looking less and less positive for our future with each passing day. I had faith that this time would be different but that faith is fading quickly. We desperately need growth alongside realistic cost cutting. We certainly aren’t cutting costs and we’re shooting ourselves in the foot when it comes to growth. I have no idea how referring to international business as whiners is encouraging for growth. It is frightening how most people don’t recognize how truly fragile our position is right now. These are exactly the kinds of statements we don’t need. Walton Brown, Minister for Home Affairs, said the international business community was “one of the impediments” to a fair tax system in Bermuda. He added: “There are elements in international business who just whine when you talk about a fair taxation system. Our system means that the wealthier segments get a tax break. The sad truth is that we need more immigration, a lot more. The sad truth is that though we may certainly feel like the island is over-populated, we have burdened ourselves so heavily that we need more people, not less. We either need to massively increase immigration to the island or face the reality that health care will get incredibly more expensive to maintain and the government pension fund will dry up. Many people really don’t understand the crisis we’re facing regarding population and demographics. 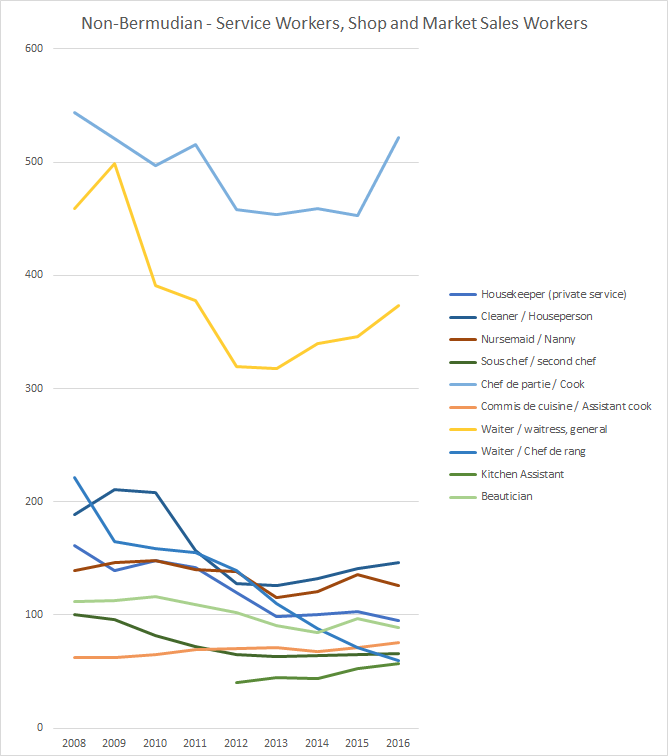 Above is a chart built from the Bermuda’s Population Projections 2010-2020 report provided by the statistics department in 2014. The key takeaway? 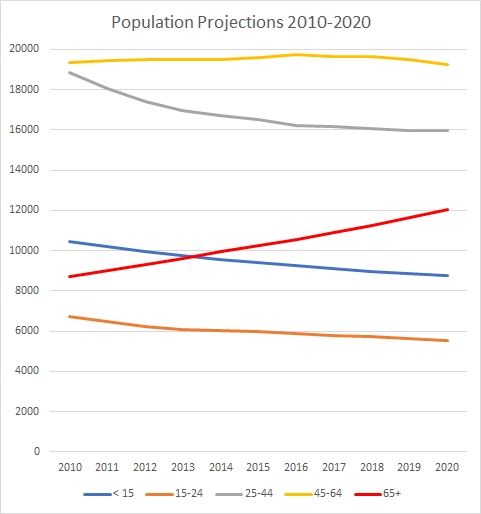 That red line representing people aged 65+ is growing substantially while the grey line representing young healthy workers is declining. This is incredibly important because our health insurance costs have for years been buoyed by young healthy expats who largely paid far more into insurance than they withdrew which helped drive down premiums. This is especially important when consider the Standard Health Premium which drives the base of private and government insurance rates. Also important is the consideration of the Bermuda Government’s Contributory Pension Fund. The more aging seniors we have, the greater the burden on a scheme that as of 2014 only had 43% of the funding required to pay out pensions and contributions not increasing this number. With a lower ratio of workers to pensioners, this will get worse until there are no more pensions. These are incredibly important points that many people don’t understand when they buy into populist notions that we are “over-populated” and we need to restrict immigration. This is the exact opposite thing we truly need to be doing or we need to be prepared to face the reality that life in Bermuda will get quite a bit more expensive from here on in. In absence of the availability of the actual proposed “Bermuda Immigration [No. 2] Act 2017” one can only speculate as to what is being proposed. We’ll have to wait until it is publicly available to make a more concrete judgement. However, the optics are plain terrible. Why rush straight to proposing a bill with no prior warning, announcement or “bi-partisan immigration reform” consultation? Let’s be honest. The PLP have a mandate to fix the loophole regarding discrimination based upon place of origin. That’s wholly understandable and it isn’t a surprise if their aim is to fix it. The problem is if we mess up the approach such that we send a message that we’re promoting discrimination against non-Bermudians. This would be a massive misstep and could be terribly damaging. Why in the world is this going straight to a bill? Why the rush? There are many 100 day pledges unfulfilled, this wasn’t specifically listed as one nor listed as part of the platform. Why do we urgently need to table a bill on this? The risk here is massive and I don’t think that should be understated. It doesn’t matter what the underlying intentions are, the problem is that if you don’t manage perceptions it can blow up in your face. This was the OBA’s biggest failing and frankly, the PLP have shown a few times now that they didn’t learn from the OBA’s mistakes. By contrast – take a moment to review how Col. Burch outlines the mail processing facility situation. The way he’s outlined the problems, how we got here, the options and the reason why an urgent solution was chosen is impressive. That’s an example of how an urgent situation should be handled, and minus a urgent solution, it’s also an example of how non-urgent situation should be handled. Why risk controversy unnecessarily when we’re already in such a fragile position as an island? “With jobs for non-Bermudians continuing to grow while Bermudian jobs are lost in the tourism industry, it is clear that a new approach is needed to ensure that Bermudians come first in jobs and opportunities in our own country,” the Minister continued. “The Government, working in tandem with the Department of Immigration, the Department of Workforce Development and stakeholders, will conduct an industry-wide skills and needs assessment of the tourism industry to identify areas where unemployed or underemployed Bermudians can be trained to fill or be promoted into jobs currently held by non-Bermudians. Sometimes these things are made out to be big projects when really they can take just a few minutes of data analysis. For example. If we look at the Employment Surveys over the last few years, “Service Workers, Shop and Market Sales Workers” category is most fitting of the majority of “tourism” jobs. We can look at the numbers filled by non-Bermudians to determine where there is demand that we could be providing improved training. Here are the top 10 jobs filled by non-Bermudians in the category. Note that the largest categories saw massive declines in the recession and are only starting to recover. Looking at these numbers, the biggest areas of growth are inside kitchens in the form of chefs, cooks and kitchen assistants as part of wait staff and as cleaners/nannies.